With Just Potent Melatonin (5mg), your best night sleep awaits! In the United States, it is estimated that over 70 million adults suffer from one form of sleeping disorder or the other. Of this staggering figure, 42 million have a chronic sleeping disorder. If you have difficulty sleeping or staying asleep, we have a solution for you: The Just Potent Melatonin (5mg). We have formulated the Just Potent Melatonin with the purest of ingredients to help you effectively tackle your sleep problems. The ingredient in the Just Potent Melatonin (5mg) is so pure we termed it “Pharmaceutical Grade”. Sleep is vital to virtually everything we do. We need quality sleep so our brains can function properly. When we don’t get quality sleep, we expose our bodies to a lot of health issues. These health issues can either be physical or emotional, or both. All too often, we overlook the fact that we don’t get the recommended hours of sleep. There are hundreds on reason why some are sleep deprived. For those times you need to get a good number of hours of sleep, you can count on the Just Potent Melatonin (5mg) to get the job done. And when the job gets done, don’t expect to be groggy the next morning. Our motto for the Just Potent Melatonin (5mg) is: No Grogginess. From sourcing of ingredients to production, to packaging, to the final product, we haven’t cut corners. We produce the best melatonin money can buy. While other manufacturers misstate potency on their labels, we offer nothing but 100% honesty on our product labels. What we say is on the label is what you get; nothing less, nothing more. When you choose the Just Potent Melatonin (5mg), you’re getting nothing but potent 5mg melatonin in its unadulterated form. Are You Ready to Take Back Your Sleep? 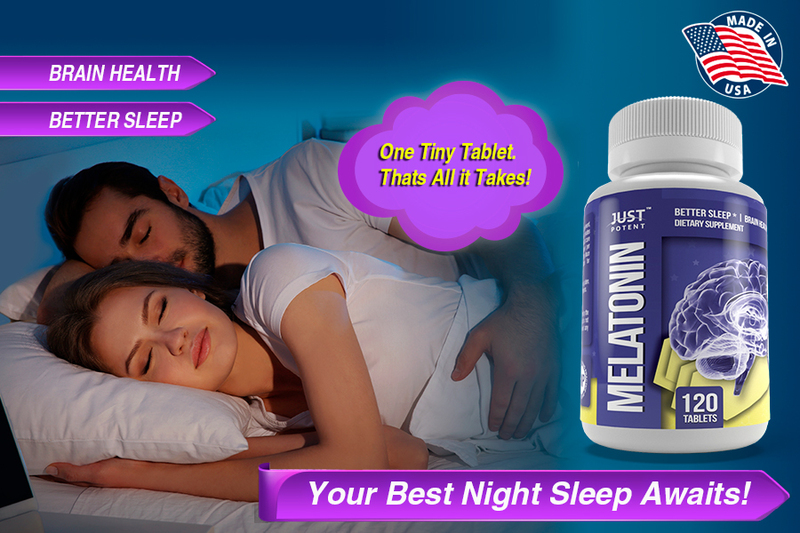 Thousands of customers have taken back their sleep just by using one tiny tablet of the Just Potent Melatonin (5mg). Are you ready to take that first step to retaking your sleep? Order a bottle today! Adults, take one (1) tablet daily 20 to 30 minutes before bedtime or as directed by a healthcare professional.